The back door can be locked/unlocked and opened by the following procedures. Make sure that the lower side of the back door is closed before closing the upper side of the back door. 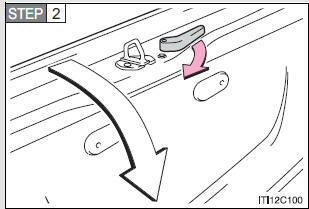 Lower the back door using the back door handle, and make sure to push the back door down from the outside to close it. 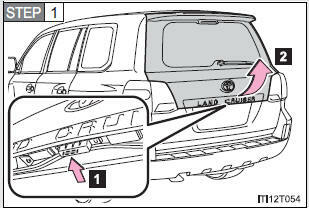 The rear step bumper is for rear end protection and easier stepup loading. The back door can be operated from the inside. 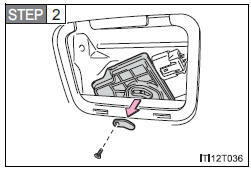 Remove the screw and cover. Push the lever for the back door motor, open the back door. Keep the back door closed while driving. 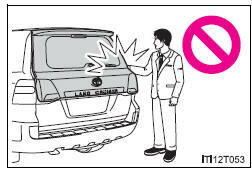 Before driving the vehicle, make sure that the back door is fully closed. 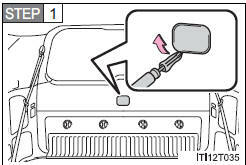 If the back door is not fully closed, it may open unexpectedly while driving, causing an accident. Never let anyone sit in the luggage compartment. 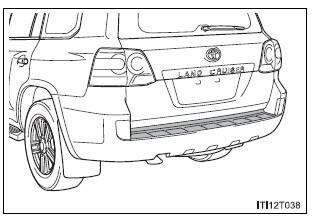 In the event of sudden braking or an accident, they are susceptible to death or serious injury. Remove any heavy loads, such as snow and ice, from the back door before opening it. Failure to do so may cause the back door suddenly shut again after it is opened. The back door may suddenly shut if it is not opened fully. It is more difficult to open or close the back door on an incline than on a level surface, so beware of the back door unexpectedly opening or closing by itself. 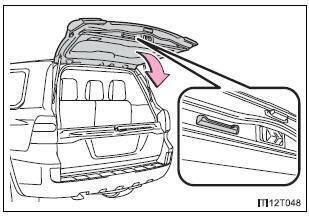 Make sure that the back door is fully open and secure before using the luggage compartment. When closing the back door, make sure to press it lightly on its outer surface. If the back door handle is used to fully close the back door, it may result in hands or arms being caught. 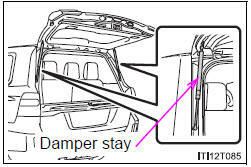 Do not pull on the back door damper stay to close the back door, and do not hang on the back door damper stay. 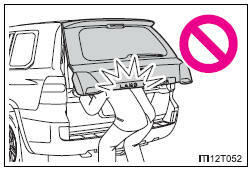 If a bicycle carrier or similar heavy object is attached to the back door, it may suddenly shut again after being opened, causing someone’s hands, head or neck to be caught and injured. 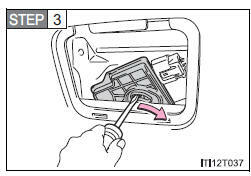 When installing an accessory part to the back door, using a genuine Toyota part is recommended.